This is the only shopping app that has been consistently updated and improved since day 1, and we promise to keep listening to you and bringing the features you want! ✔RedLaser Barcode Scanning(US only for launch) Use the camera to quickly scan any item in your pantry and add it to your list. We search multiple product catalogs to find the item, but you can always enter your own description and make it your own (unlike other shopping apps). ✔Local Flyers and Discounts from Top Retailers. Shopper searches through all the Flyers FOR YOU and shows you just what is on special for EACH item, then lets you remember it with one click. No other shopping app does this. Target, Best Buy, Walgreens, Babies R Us, Home Depot and many more. See our website for the complete list. ✔Real-time List Sharing and Syncing. Share your lists with family members so you can always be up to date with what they need and they can see what you need. ✔Shopper Connect: Our web portal for planning and managing your lists online, from any computer. If you like to sit at home or the office and think about it, this is for you. A big screen, lots of rows, no need to squint! ✔FDA/USDA Recalls. We routinely check for new alerts and recalls on products that might affect you and notify you right on your list. You can then read the entire FDA or USDA alert right inside shopper. ✔Multiple Lists/Multiple Stores. Organize multiple lists for specific stores (unlike other shopping apps), recipes, or even home improvement projects. ✔Multiple Devices. Your friends and family don’t all have iPhones. Others say it, we do it. We are on Blackberry now and we will be on Android and other platforms when your friends (or you) are! Shopper is a paid app that has sponsor content from brand and retail partners carefully selected to be relevant to just what you are shopping for. This includes content (like recipes, guides, contests, quizzes, project instructions, product info, recall notices, evaluations and ratings) as well as specials and coupons. We think this makes sense in a shopping app and saves you money, but if you do not wish to receive this content there is an upgrade subscription available in-app for $1.99 per year that removes it. 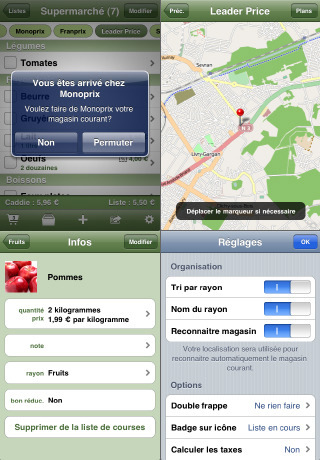 See Shopper’s app settings screen within Shopper. Thanks for your continued support, and please follow us on twitter (@shopperapp). To ask questions or send suggestions please visit the Shopper Forums at forum.myshopperapp.com. Beware of bogus reviews from competing app developers!